Arleigh Burke-class guided-missile destroyer USS Stethem (DDG 63) joined with People’s Liberation Army-Navy PLA(N) guided-missile frigate Xuzhou (FFG 530) to practice the Code for Unplanned Encounters at Sea and conduct a search-and-rescue exercise, Nov. 20. Stethem concluded a scheduled port visit to PLA(N) East Sea Fleet of Shanghai that same day, where crew members of both ships took part in cultural exchanges, ship tours, receptions, and sporting events. Stethem visited Qingdao, China, in July and operated with the PLA(N) North Sea Fleet. 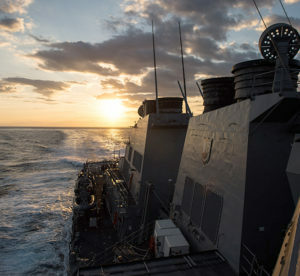 CUES, a set of procedures endorsed by naval leaders at the Western Pacific Naval Symposium in April 2014, is a guideline for unplanned maritime encounters while at sea, providing standards for communication, safety procedures, and maneuvering instructions for naval ships and aircraft. Stethem and Xuzchou rendezvoused and used CUES as a signaling protocol to indicate ship maneuvering, and passed Morse code to one another. Xuzhou then dropped a search-and-rescue dummy in the water, which was retrieved by one of Stethem’s small boats. Stethem is forward deployed to Yokosuka, Japan, and as a member of Destroyer Squadron 15, plays a vital role in maintaining partnerships in the 7th Fleet area of operations.